Preheat oven with heavy roasting tray to 200°C. Peel and cut potatoes into 5cm pieces. Place potatoes in saucepan on stove top and cover with cold salted water. Bring to boil and simmer for further 2 minutes. Meanwhile place olive oil on hot roasting tray and heat in oven. Drain potatoes in a colander and return to stove top. Over a very low heat, shake potatoes vigorously to roughen and fluff up the edges. Carefully place potatoes on hot tray. Work quickly and roll each potato in oil and return roasting tray to oven. 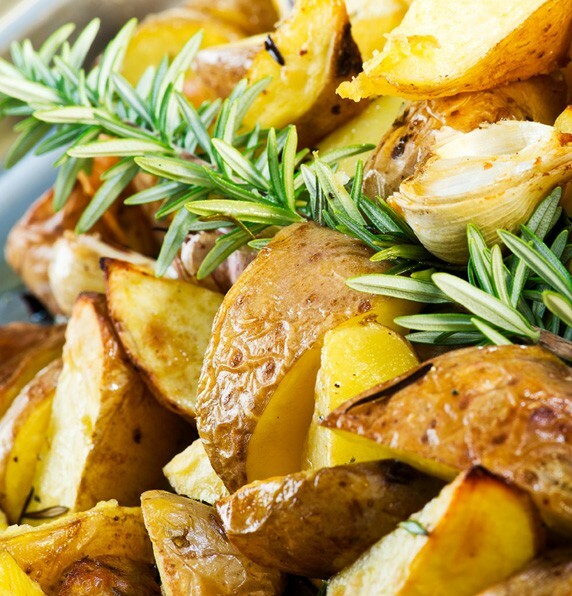 Roast potatoes for 30 minutes or until lightly golden then take out, turn over and season. Return to oven and cook for remaining 20 minutes or until golden and crispy. Season once again and serve immediately. TIP: Preheat oven with pan before adding the potatoes. A hot tray ensures even cooking and makes them even crispier!